This post is sponsored by the Bj’s Whole Sale Club but the content and opinions expressed here are my own. 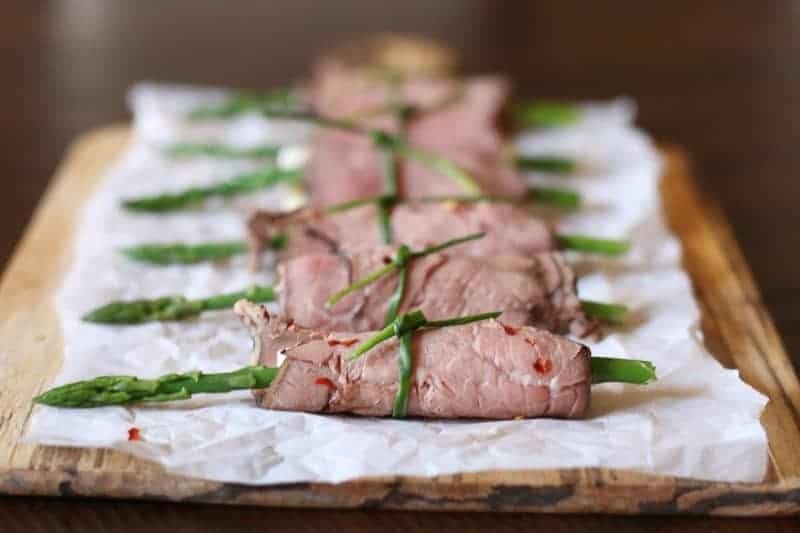 This is a quick and easy Low Carb Asparagus and Roast Beef Rollups Recipe. 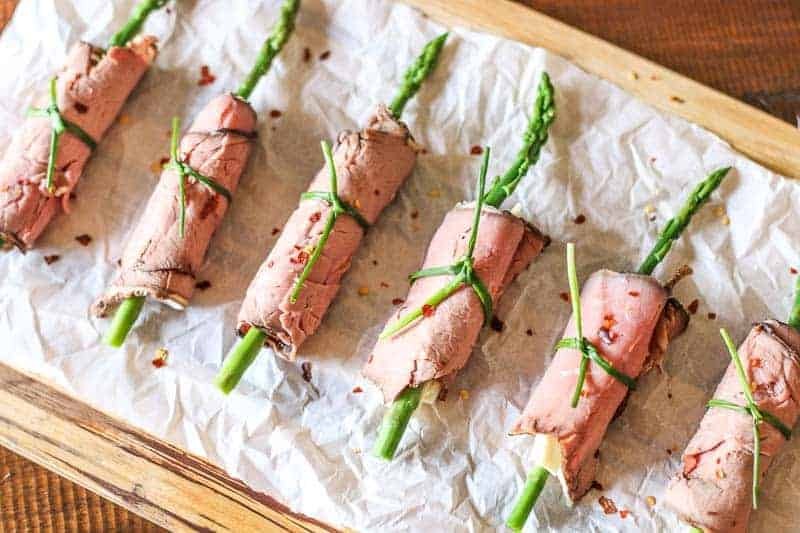 These easy Low-Carb Asparagus and Roast Beef Roll Ups make a beautiful appetizer for entertaining at your dinner parties and cook outs. They also are perfect for a delicious healthy snack! I am a regular shopper at BJ’s Wholesale. Their gas is the cheapest in town, and since I am always carpooling kids everywhere, I fill up there regularly. Bj’s Whole Sale also has AMAZING products and great prices. When you walk in the store, you are greeted at the door with coupon flyers showcasing all their great bargains. You can use those coupons and the coupons you bring from home on any of their merchandise! Win! Win! 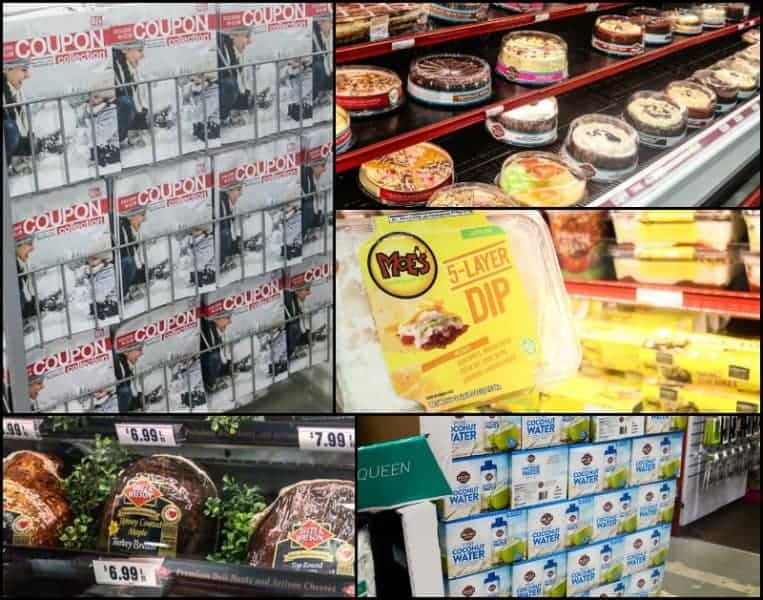 I have a few favorites that I can’t live without that I can either only find at BJ’s Wholesale in my town and/or they have the best price for those items. Moe’s 5 Layer Dip, Coconut Water, and the meat from the fresh deli to name a few. Check out this quick video where I tell you about my top 10. You will want to watch it. I probably buy some goodies at incredible deals that you will want to stock up on that you are not currently buying. I show you the prices so you can see how great the savings are. You can get $10 off for a membership here. The deli department is INCREDIBLE at BJ’s Wholesale. It is probably my favorite thing about BJ’s Wholesale. It is ridiculously cheap compared to other stores. I save, save, save! But more importantly, they only offer high quality meat and cheese. I stock up like crazy every week on deli meats and cheese. My daughter is very picky about her sliced turkey and I can only buy it at BJ’s. My husband and I fell in love with Wellsley’s Farms Roast Beef. The roast beef is full of flavor, cooked to perfection, and absolutely delicious. One day, the deli department employee recommended I try the Horseradish Cheddar with our Roast Beef. Horseradish cheese sounded peculiar to me, so I was leery to try it. I was shocked how delicious it was. I stocked up on it, brought it home, and my husband devoured it. Later, I hosted a party and wanted an easy appetizer that was healthy and pretty. That is when I came up with the idea of wrapping the roast beef and horseradish cheddar around a steamed asparagus. I tied the chive to look fancy and pretty. They were gone in minutes. If you are throwing a party with a bunch of men coming over, this is their kind of appetizer. They love the meat and cheese combo. Best thing is the combination is so flavorful, you don’t have to add any sauce or dip. Four ingredients! Isn’t that fantastic? I prefer the Wellsley Farm Angus Roast Beef and the Dietz Watson New York Aged Cheddar Cheese with Horseradish from BJ’s Wholesale for this recipe. BJ’s Wholesale also has a beautiful selection of produce. You can grab a bag of their asparagus for this recipe and use the remainder of the bag for a side dish! Try this recipe. I advise doubling the batch. My Asparagus and Roast Beef Rollups disappear so fast I rarely get to have one myself at my parties. I have to hide a stash for my husband and I for later. xoxo! Guess what? You can get $10 off for signing up through this link! Check it out and save on your shopping favorites. If you like this recipe, check out: Black Forrest Ham, Egg, and Cheese Cups, Grilled Sriracha Zucchini, and Dill Pickle Dip. 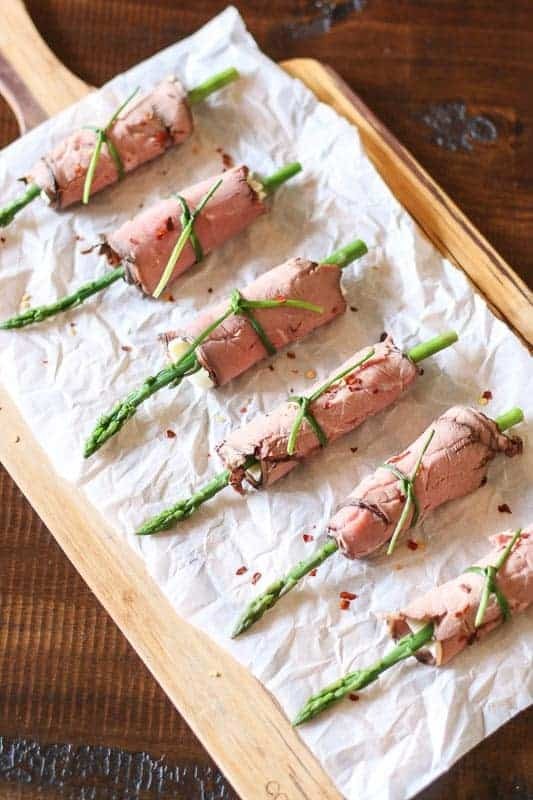 These easy Low-Carb Asparagus & Roast Beef Roll Ups make a beautiful appetizer for entertaining at your dinner parties and cook outs. Add a half slice of Sharp Cheddar Horseradish Deli Cheese to center of a Roast Beef Deli Slice. Add asparagus to edge of roast beef slice. 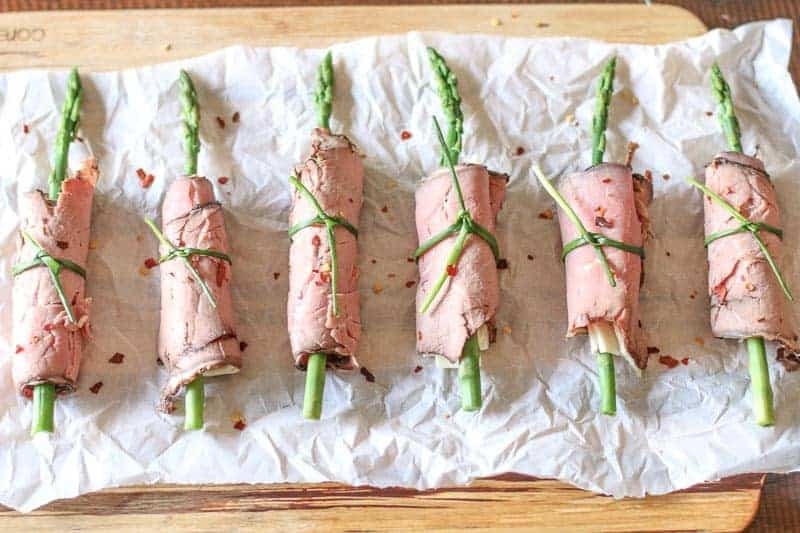 Roll Asparagus from one edge of roast beef to the end. 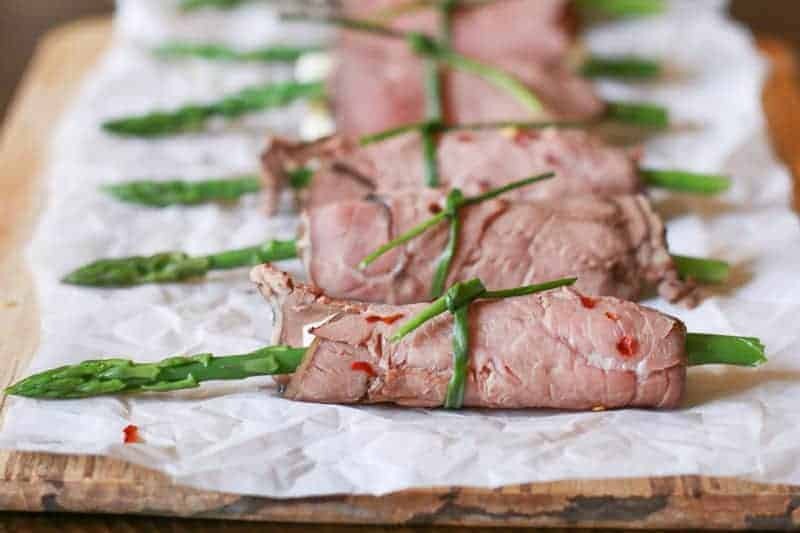 Tie chive around center of Asparagus and Roast Beef Roll Up. Sprinkle with red pepper flakes for garnish. This is a great party recipe! As a dietitian, I’m always looking for healthier ideas! What a creative and delicious combination! I’ve never thought of roast beef for the roll-ups. Oh my gosh! This looks so good! I love the idea of the horseradish cheddar and the chive string. I can’t wait to serve this at my next party! I LOVE this idea! How pretty for a party. And my husband likes any excuse to have roast beef, so he’ll be happy for me to make these! Your nickname now is video girl! lol! You know how much I love your video and you make me want to shop at Bj’s for everything too 😉 I could eat rare roast beef every day. And horseradish cheese? Yes, please! We have a local dairy farm that makes their own horseradish cheese so I’ll have to pick up some of that to make this. Perfect for game day eats too! Great post. I love your video of your 10 best picks. I have shared this great appetizer around on social media. I think it’s genius, Katie. My low carb readers will love it. Wait.. someone combined horseradish and cheese??? My hubs would be ECSTATIC if I found some of that! I’ll keep my eyes peeled for it! This is such a genius, simple appetizer! 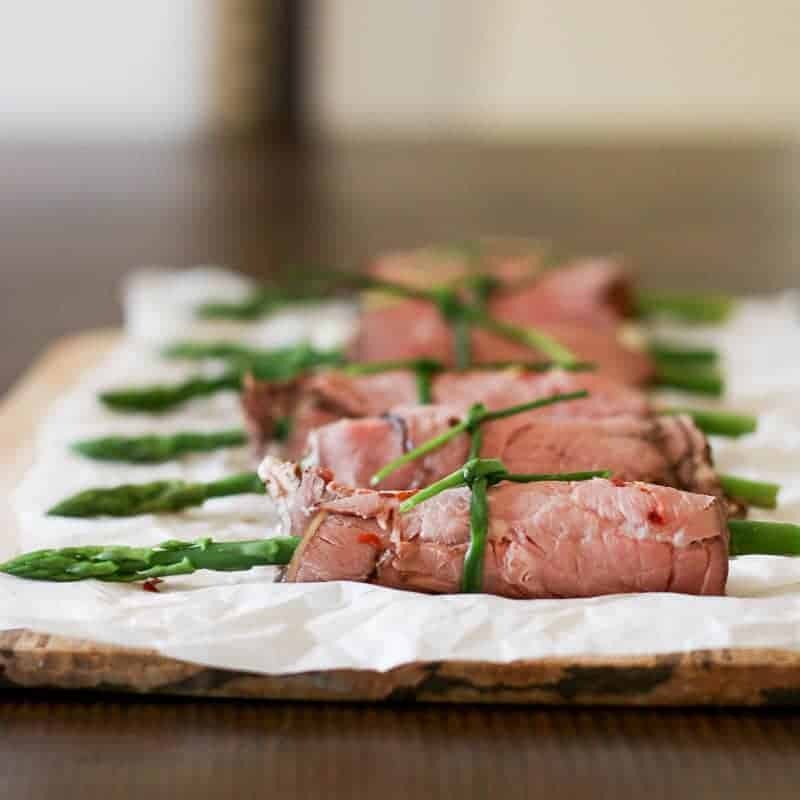 I love the idea of horseradish cheddar with the roast beef and asparagus — so much flavor and just a bit of kick, without the need for a messy sauce. Finger food at its best right here! This is so simple, but very appealing. The horseradish cheese really sets it apart. No need for dip which makes it so easy. I can see how this can be such a hit at parties!! Great recipe!